Hey, it’s Elena. I love the Row Houses Clear Stamps set from Krista Schneider and decided to use it to create a whimsical postage stamp card. It’s not meant to be realistic but more of a dreamlike landscape to let your mind “explore” all of life’s possibilities. With a pencil, lightly sketch a distant horizon line (high up on the rectangle) and a winding road that travels down from the horizon and spreads across the bottom of a 4 ¼” x 5 1/2” vertically-oriented piece of 85 lb. White Soft Finish Cardstock. Using permanent black ink, stamp the coffee shop and 2 of the row houses going up the hillside on either side of the road. 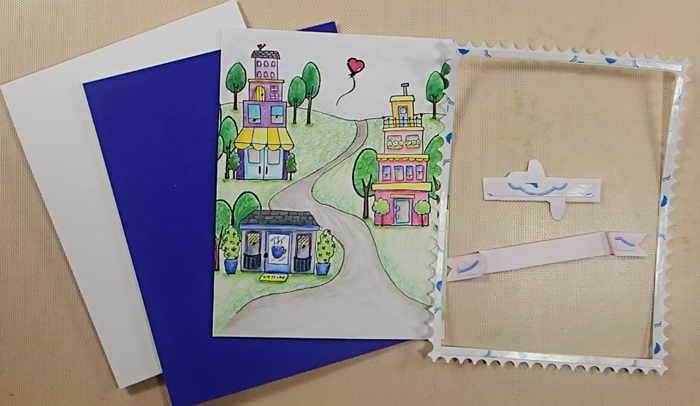 Create masks for the buildings by stamping them on to a large sticky note and fussy cutting them out. Place the masks over the buildings and stamp several groupings of trees around them and up the hillside as desired (Photo A). Remove the masks and use a thin permanent black marker to trace your sketched road and hillside, avoiding any areas that are overlapped by the buildings, and erase any pencil lines that show. Color the scene with your desired coloring medium. I used Prismacolor Premier colored pencils and odorless mineral spirits (Photo B). Fit together the largest Postage Stamp Rectangle die and the second largest Fitted Rectangles die on a piece of 85 lb. 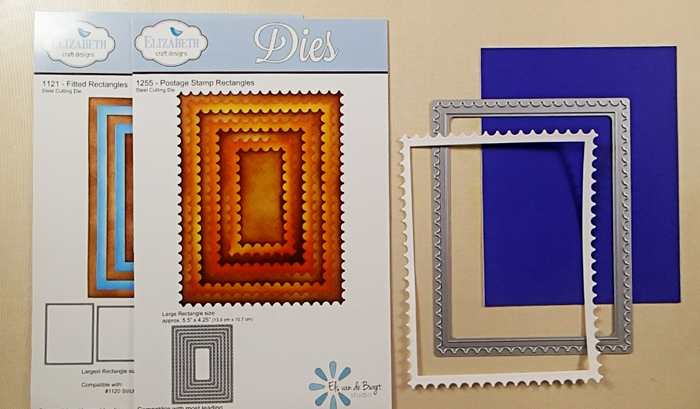 White Soft Finish Cardstock and die cut out a Postage Stamp frame for your scene. Use the frame to determine how best to trim your colored scene down to 4” x 5 ¼”; trim to size. Cut a piece of True Blue Soft Finish Cardstock to 4 3/8” x 5 11/16” to use as a mat for the scene. Stamp the heart outline stamp from the Dream Sentiments Clear Stamps set using permanent black ink into the sky of your scene and draw a thin balloon string with a knot at the base of the heart using a fine nib permanent black marker (Photo A). Color in the heart and coat with a clear glaze medium to give it dimension and shine. Stamp the “Explore” greeting in a detail black ink onto 85 lb. White Soft Finish Cardstock and trim to approximately 2″ x 7/16″ (making sure to leave extra space for the loops on the P and L). Cut a piece of Ladybug Red Soft Finish cardstock to 4” x 7/16″. Place the “Explore” piece into the center of the red strip and use a bone folder to score an angled line into the red strip about 1/8” from each end of the “Explore” greeting. Fold the red back at each score mark and then fold forward. Cut a triangle at each end of the banner. (Photo B) Note: Banner and greeting shown in photo are larger but were later trimmed down to the sizes listed here). Cut an 11” x 4 5/16” rectangle from 100 lb. White Soft Finish Cardstock. Score at 5 1/2″ and fold in half to create a top-folding card base. Add 10 mm Clear Double Sided Adhesive Tape to the backs of the True Blue panel and the colored scene. Add 3 mm Clear Double Sided Adhesive Tape carefully to the back edge of the postage frame. Add 6 mm Clear Double Sided Adhesive Tape to the back of the “Explore” greeting and the fishtail ends of the banner. If desired, add small foam dots to the center portion of the banner for added dimension. To construct the card, adhere the True Blue panel to the front of the white card base. Then, very carefully line up the Postage Frame around the scene panel and press into place. I started by removing the backing from only the top strip of tape and pressing that in place first so the remaining frame edges would then easily align with the edges of the scene. Adhere the Postage Stamp scene piece to the True Blue panel. Adhere the “Explore” greeting to the center of the red banner and then adhere the banner in place along the bottom of the scene. Enjoy! The card is so darned cute! Great to see how you put it together. Thanks for sharing. Hi Elena, I loved watching you create this gorgeous card !! I was mesmerised with your colouring, the houses look gorgeous, they are really quirky, I love them. I must say that I need the postage stamp rectangles dies, what a lovely effect you have here with them. Something else that has really impressed me – the word ‘Explore’ on the banner, I adore the fact that the ‘p’ loops underneath and the ‘l’ loops on the top – fabulous. Small things like that really jump out to me hahaha. Thank you for the video, I could have watched you all day. Thank you for the wonderful instructions on making your wonderful scene. I want to visit there!!! The banner and the balloon are perfect finishing touches to an already perfect card. This is an adorable card. I love how you colored this really cute little scene. J’aime cette carte, cute. Merci pour les infos et techniques.